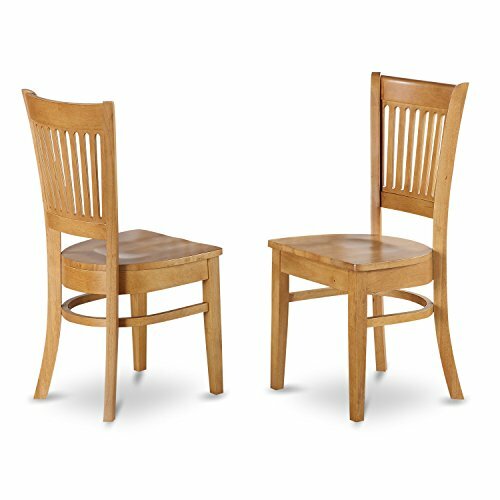 East West Furniture VAC-OAK-W Wood Seat Kitchen/Dining Chairs, Oak Finish, Set of 2 by East West Furniture at Global Supplies Express. MPN: VAC-OAK-W. Hurry! Limited time offer. Offer valid only while supplies last. Kitchen dinette chair constructed of all hardwood. Casual Kitchen chair finished in oak. Casual dining room dinette kitchen chair with wood seats. Kitchen dinette chair constructed of all hardwood. Casual Kitchen chair finished in oak. Casual dining room dinette kitchen chair with wood seats. Including vertical slatted back. Traditional styling with an elegance deserving of formal dining. Slat-back Chair are inviting with comfortable. Kitchen dining chair are rich in Asian hardwood. Assembly Required. Include: Set of 2 Vancouver Wood Seat Kitchen dining Chairs in Oak Finish. If you have any questions about this product by East West Furniture, contact us by completing and submitting the form below. If you are looking for a specif part number, please include it with your message.